Mixed Media Artist: Happy Thanksgiving...or is it still Halloween? Nothing like being so far behind in my work that it takes me all the way to Thanksgiving before I get around to sharing our Halloween costumes with you! Our wonderful friend Deb invited us to a post-Halloween Masquerade with a Mayan/Steampunk theme. 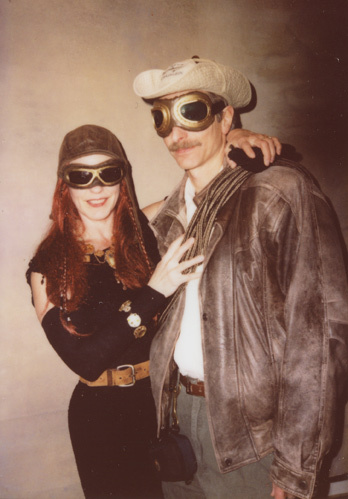 Something to do with the world ending in December ;-) We went for a steampunk aviator with her intrepid explorer of Mayan ruins. That's our story, and we're stickin' to it!